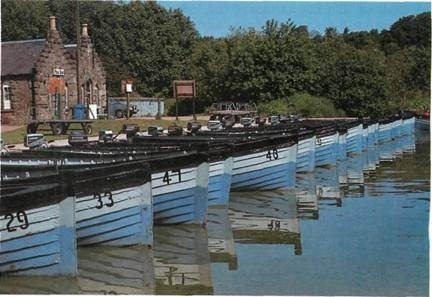 A deserted armada of wooden boats lies motionless on the algae-choked surface of Loch Leven. Normally very busy during the trout season, the Fishing Lodge on this famous brown trout water is like a saloon in a western ghost town. Flat water and unrelenting heat spell one thing for anglers in Scotland: loch-style suicide. 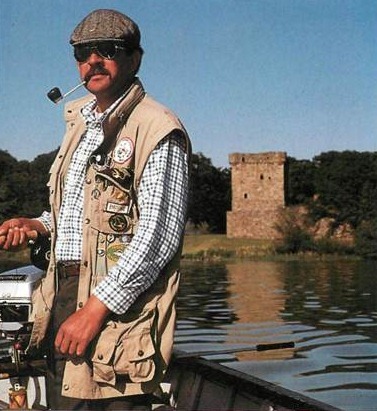 With Loch Leven Castle in the background, Stan Headley looks for surface activity in the evening. 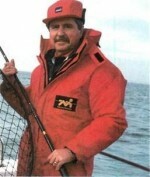 Stan, from Orkney, Scotland, has been fly fishing for thirty-five years. Scottish National champion in 1990 and a member of the Scottish Fly Fishing Team, he competes in matches all over Europe. Steeped in centuries of history, the loch is not only famous for its brown trout. Mary Stuart, Queen of Scots, was imprisoned in Loch Leven castle for about a year before escaping and fleeing to England, where she was beheaded under the order of Queen Elizabeth I.
Stan double-hauls the limp Hi-D through the mid-morning heat. By car Just north of Edinburgh, Loch Leven is off the M90. Leave the motorway at junction 6, and drive into the town of Kinross. Take the B996 southwards, and look for signs to The Pier. By train The nearest BR station is in Cowdenbeath. 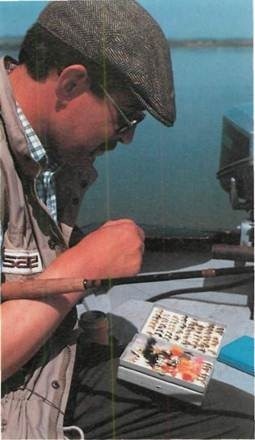 With myriad flies to choose from , Stan changed patterns often to try and find the successful one for the day in this case a Cat’s Whisker, always a reliable lure to have in your box. Bank fishing is not allowed on Loch Leven. Boat charges – for three rods -vary according to the time of the season (April-October). 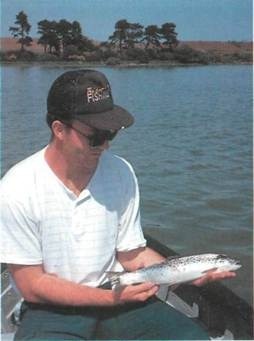 For more information about brown trout fishing on Loch Leven, contact the fishery manager, Loch Leven Fisheries, Kinross, Scotland (tel 0577 63407). The day was transformed after the first brown was solidly hooked. These wild fish don’t display the surface acrobatics shown by rainbows, but fight just as hard, preferring the safety of deep water to wage their battle. Early summer is when the trout are at their peak -strong and tenacious in the depths Casting Hi-D lines isn’t easy. To make it shoot through the rings better, Stan always soaks his line in a small bucket (or boat baler) of water before using it. 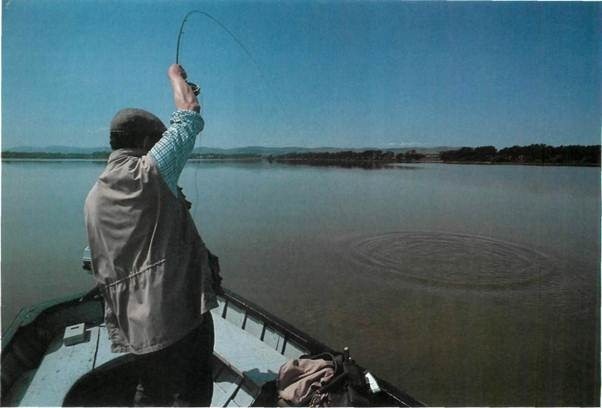 And if he’s using another rod, he keeps the Hi-D wet and limp – this is especially important if it’s really hot. The sun can wreak havoc with fly lines. Close to the boat, the trout rears its head , turns away and once again goes down before Stan can net it safely . Make sure you don’t rush or panic, and you won’t lose your first Leven trout. Stan spooned both fish to find them completely stuffed with tiny daphnia. By pausing at the end of the retrieve and then pulling quickly, you can sometimes entice a following trout to strike -even if just lip-hooked, it’s better than nothing. No red marks on Stan’s Leven grazer, all 2 ½ lb (1.3kg) of flecked silver (Loch Leven trout are famous for their silvery appearance). Booby fishing from a boat must be done at a standstill otherwise the line won’t be fishing along the bottom. The Hi-D lies hard along the bottom, and the Booby rides up, drawing the other flies with it. When you retrieve line, the Booby and other flies dive down; when you stop, the flies rise up again. This diving-darting motion works well for stillwater trout. 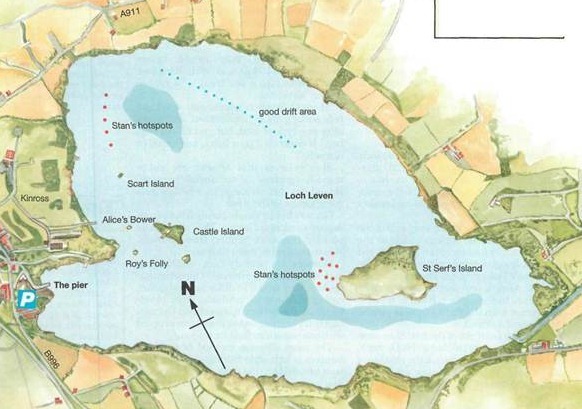 We pack our gear in the boat, buy several cans of soft drinks and a few bars of chocolate and motor out about 100m (110yd) off Scart Island on the north-west side of the loch, passing only a few boats. The beads of sweat form, and our eyes begin straining as we look over the flat surface of the loch which mirrors the hot sun and clear sky. The motor is cut, and the boat languidly ploughs to a halt on the thick algae which looks like a green oil-slick. Ever since the late 1960s Leven has suffered with tremendous algal blooms. Sewage effluents from Kinross and agro-chemical run-offs built up alarmingly in the loch in the late 1960s and early 1970s, and the added phosphates and nitrates gave rise to the algae. 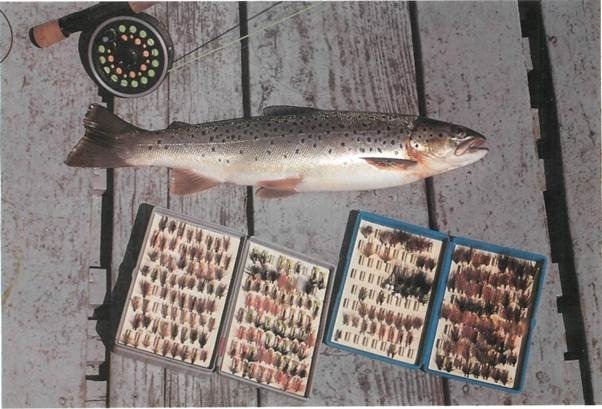 Crustaceans and shellfish, important food sources for young trout, disappeared, probably because of low oxygen levels. 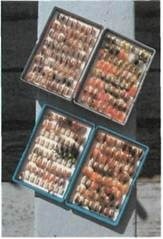 The health of the trout deteriorated, and many died. 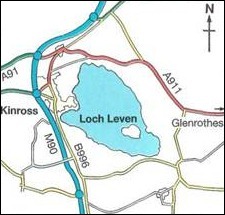 The loch’s expected catch for 1992 -15,000-20,000-is a long way from the 1960 returns of 85,000 trout, but the owner, Sir David Montgomery, is convinced that, with the sewage renovations in Kinross and the declining number of dairy farms nearby, the water quality should improve in time. A team of mini-lures – Yellow Ace, Viva and a Cat’s Whisker on the point – are his choice at the moment. He’s no longer fishing along the bottom; the Hi-D just gets the flies down, allowing him to retrieve quickly. He reckons that since the algae and the daph-nia feeding on it are green, the water will be reflecting the same colour. So fly colour should be green or yellowish-green for maximum effectiveness. As he’s varying the retrieve, speeding it up and slowing it down, a single, wrenching pull goes as unexpectedly as it came, leaving Stan in mid sentence. A Leven trout doesn’t pluck away at a lure; if it’s not on the hook first time, forget it. Along the way when queried on depth, he replies, ‘Trout sometimes suspend over the deepest part of the loch. Normally you wouldn’t think the fish would be there – but this isn’t the case. Midges can hatch over very deep water.’ The deepest part of Loch Levenis24m(80ft). We work the north-west corner of the loch, the depth being only about 3.6m (12ft) maximum. Stan casts out, waits for the line to sink and begins stripping. As the flies near the boat, he halts momentarily and makes one more strip. 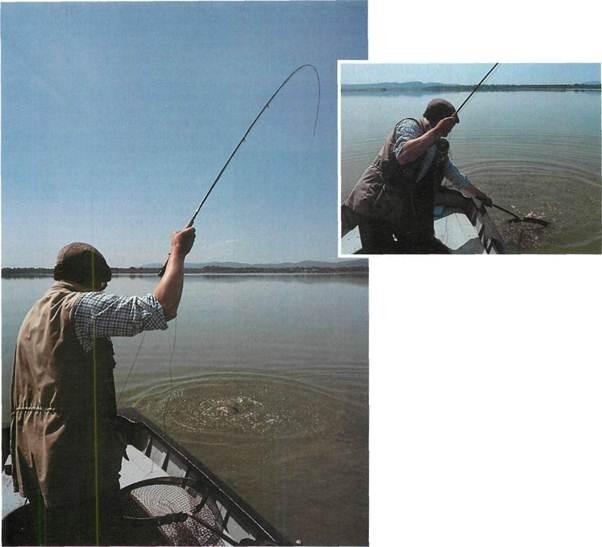 A brown trout hits at the very end of the retrieve, and his rod springs to life as the fish bores to deep water. 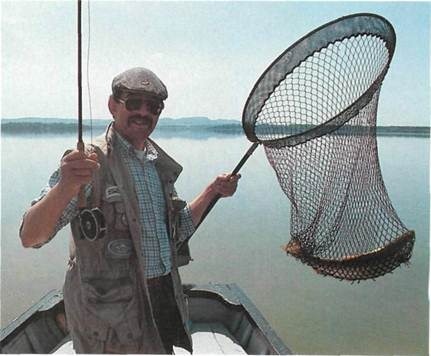 Stan holds his rod high, applying constant pressure, but the trout won’t yield ground. He doesn’t rush the fish. After a few deep runs, the trout soon comes to the surface. Beaten, it slides into the net with the Cat’s Whisker pinned to the side of its cheek. He spoons the fish and finds a gutful of daphnia which are absolutely bursting with algae. Daphnia-feeding trout are particularly aggressive, he says. The bright, highly mobile patterns he uses are designed to be easily visible and to trigger the trout’s aggressive instincts. Stan believes that browns are either nomadic ‘grazers’ or territorial ‘hunters’. He adapts his strategy to whether he’s going for one or the other. Grazers live in shoals and feed mainly on daphnia and insect larvae. They are usually smaller but more prolific than hunters. Where the food is, there they are. Hunters are solitary fish, establishing and defending territories. Opportunistic feeders, they adjust to different food forms, eating whatever is available, from bloodworm on the bottom to insects on the surface to fry bashing- they aren’t preoccupied with one particular food for too long. 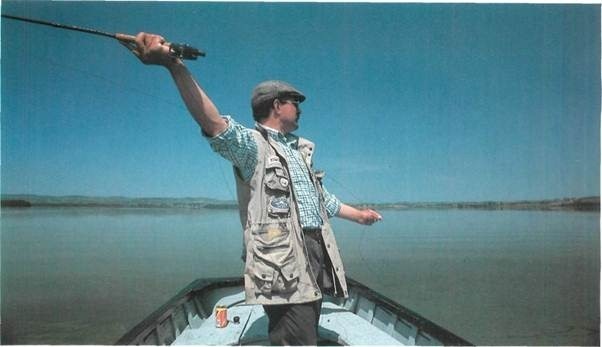 The most effective method of catching hunters is loch-style fishing – drifting in a boat broadside to the wind, using a floating line and team of traditional patterns. The technique won’t catch Leven grazers: it does, especially during the evening when the fish are up in the water, feeding on hatching midges and sedges. 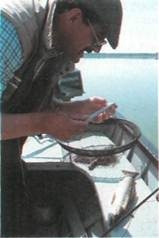 During the day, however, sinking lines and mini-lures lures are more effective. After a much-needed break at 6:00pm for dinner, we’re back in the saddle. Though the sun is still out, the wind has picked up nicely, forming a good chop of Leven’s surface and concentrating the algae in the north-west corner of the loch. With a new Airfio glass floater in a WF7 and 12ft (3.6m) three-fly leader, Stan attaches a mini-muddler (size 12) on the point, a Kate McLaren (14) on the middle traditional loch-style approach began at Leven and spread out all over Britain, but when the tradition began, hunters were the main type offish being caught. Stan believes that most of the trout of Leven have altered their feeding habits to adjust to the different habitat. Increased nitrates and phosphates in Loch Leven have created the thick algal blooms which restrict the amount of light penetrating the water, reducing food for hunters and limiting their territory. It’s not that the traditional loch-style and a Soldier Palmer (14) on the top. The wind is good, and we begin traditional loch-style fishing on Leven – at the time when it’s most effective. Stan casts about 15-20m (16-22yd) downwind. He holds his rod above the side of the boat (about lm/3ft above the water) while stripping line quickly to compensate for the drifting boat. Retrieving against the waves makes the soft-hackled top and middle wet flies come alive. The tension has reached its climax. Anticipation is at its peak. Gulls nervously rock on the waves, waiting, their tempers fraying. Short-lived territorial battles are won and lost as the gulls jockey for position. The ensemble begins as the birds screech out and mount their attack from the air, bobbing and weaving to pick off the delicate, weak-flying big red buzzers. Steely browns knife through the surface, mopping up the struggling emergers. These are big buzzers – at least 1.25cm long. With dries and emergers we cast to rising fish again and again, but they don’t seem to be fooled so easily in the now calm conditions and relatively flat water. Stan has a take, sets the hook but loses it. We cover fish after fish, but the takes don’t come. Switching to small traditional wets, Stan pulls them slowly through the surface and is in with a small brown of about (0.34kg), which he immediately releases. We continue to cover the fish until the buzzer hatch ends all too quickly. With it the ultra-selective browns move down in the water. At 11:00pm we motor back to the Fishing Lodge to discover that twenty-five three-man boats caught eleven wild browns for the whole day. 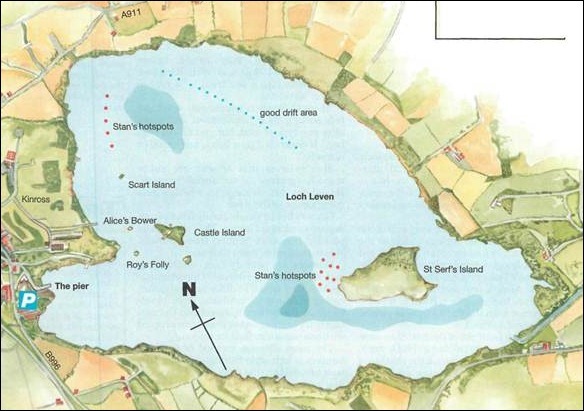 Even in ideal conditions anglers regularly blank on Loch Leven – it’s a difficult venue. But it’s the quality, not the quantity, that counts, and one decent trout for Stan is a good result, especially in the hot conditions.